Getting the better of a team in five consecutive games isn’t a walk in the park by any stretch of the imagination. It’s more so when the opposition is an established side at the international level. It also speaks tons about the quality of the winning side. India have performed exceptionally well in limited overs cricket over the past decade and their records have exhibited their dominance on the cricketing field. Over the last ten years, India have whitewashed a team in a 5-match ODI series as many as six times. In our article, we take a look at the instances when India have rolled their opposition over on every occasion in a 5-match ODI series. India came into the One Day International series on the back of a thumping victory in the Test series. The players oozed confidence as they looked to replicate the same form in the One Day format. Quite expectantly, they did it in style and with sheer disdain. 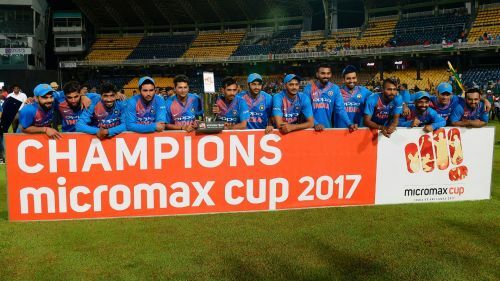 For the second time, they went on to beat Sri Lanka by a margin of 5-0 in a bilateral ODI series. Sri Lanka had their moments in the series, but couldn’t latch on to the opportunities. In the second and third ODI, India found themselves in more than a spot of bother. However, the Sri Lankan attack was unable to turn the screws on the Indian batsmen and allowed the pressure to release.